Dental implants are among the most successful procedures in dentistry. However, there are no guarantees that an implant procedure will be successful. Given the complexity of the procedure, there are many variables that can play into the success rate. The studies show a five-year success rate of 95 percent for lower jaw implants and 90 percent for upper jaw implants. The success rate for upper jaw implants is lower because the upper jaw is less dense than the lower jaw, making the success of implantation and osseointegration slightly more difficult to achieve. The lower posterior implantation has the highest success rate for all dental implants because of the density of the bone, there’s more to work with. Dentist Brookhaven, GA: The future of Implant Dentistry is now. Dental implants are stronger and more durable than their restorative counterparts such as bridges, partials and dentures. And from an esthetic standpoint, they look and feel more natural, some of which is due to the progress made in their biocompatible development. 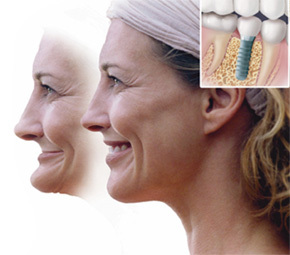 Implants offer the patient a permanent solution to tooth and continued bone loss. Additionally, implants may be used in conjunction with other restorative procedures for maximum effectiveness in that a single implant may serve to support a dental crown replacing a single missing tooth. Implants can also be used to support a dental bridge for the replacement of multiple missing teeth, and can be used with complete dentures; standard implants to increase stability and preserve bone structure. Procedural advancements mean that a larger population than ever before are finding themselves candidates for dental implants. While application and candidacy for implantation varies on a case by case basis, meaning that your dentist needs to determine the viability of implants as it applies to your actual bone structure. Keep in mind, a general dentist may perform the crown and bridge placement that is associated with implant restorations, prosthodontists are the ADA sanctioned specialists who have received post-doctorate training are most often your best bet for the successful completion of this type of technique sensitive procedure. If we can ever be of help please don’t hesitate to call or comment so we can answer your questions. Brookhaven Dentist: The future of Implant Dentistry is here now. Dental implants are stronger and more durable than their restorative counterparts such as bridges, partials and dentures. And from an esthetic standpoint, they look and feel more natural, some of which is due to the progress made in their biocompatible development. Implants offer the patient a permanent solution to tooth and continued bone loss. Additionally, implants may be used in conjunction with other restorative procedures for maximum effectiveness in that a single implant may serve to support a dental crown replacing a single missing tooth. Implants can also be used to support a dental bridge for the replacement of multiple missing teeth, and can be used with complete dentures, both standard and mini implants to increase stability and preserve bone structure. Procedural advancements, including the development of the above mentioned “mini” implants, mean that a larger population than ever before are finding themselves candidates for dental implants. While application and candidacy for implantation varies on a case by case basis, meaning that your dentist needs to determine the viability of implants as it applies to your actual bone structure. Keep in mind, a general dentist may perform the crown and bridge placement that is associated with implant restorations, prosthodontists are the ADA sanctioned specialists who have received post-doctorate training are most often your best bet for the successful completion of this type of technique sensitive procedure. If we can ever be of help please don’t hesitate to call or comment so we can answer your questions.